The White House has confirmed reports that President Donald Trump helped draft a statement about his son's meeting with a Russian lawyer. Mr Trump "weighed in" on his son's response to media, but did not dictate the wording, a White House aide said. Donald Trump Jr initially said the meeting was about Russian adoption before acknowledging he was offered damaging material on Hillary Clinton. The president's lawyer had denied Mr Trump had any input in the statement. 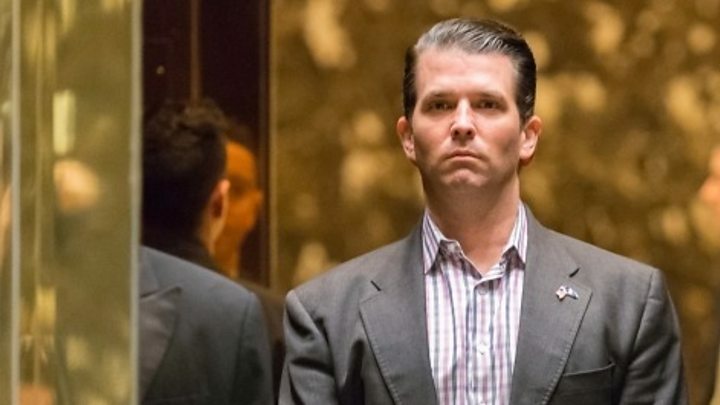 The 39-year-old US first son came under scrutiny after the New York Times began reporting last month on his June 2016 meeting at Trump Tower. White House spokeswoman Sarah Huckabee Sanders told a news briefing on Tuesday: "The president weighed in as any father would based on the limited information that he had." But she maintained he "didn't dictate" the statement and the issue was "of no consequence". "The Democrats want to continue to use this as a PR stunt and are doing everything they can to keep this story alive and in the papers every single day," she added. Ms Huckabee Sanders said there was no inaccuracy in Mr Trump Jr's statements. 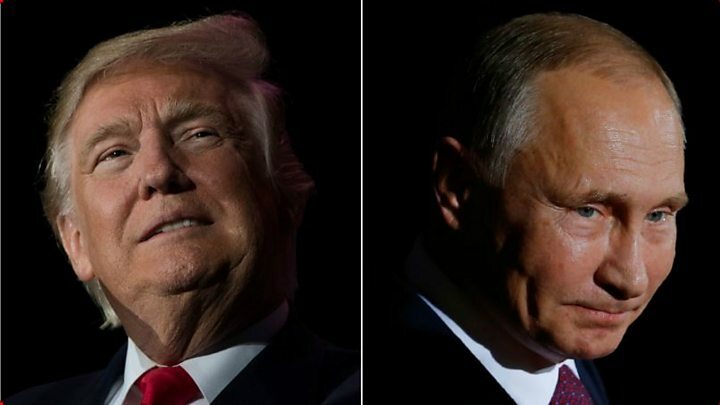 The Senate, House of Representatives and a special counsel are all investigating intelligence findings that Moscow interfered in the US presidential election in an alleged attempt to undermine Mrs Clinton - a claim denied by the Kremlin. The Washington Post reported late on Monday that President Trump himself personally dictated the statement his son issued about the meeting with lawyer Natalia Veselnitskaya. The president was flying home last month aboard Air Force One from the G8 summit in Germany when he told his son what to say, according to the newspap er. Mr Trump Jr's statement would say that he and Ms Veselnitskaya "primarily discussed a programme about the adoption of Russian children". The initial plan was for Mr Trump Jr to fully disclose what he knew about the meeting, the Post says. But that decision was reportedly reversed and his first statement said they had discussed the adoption of Russian children, not campaign issues. 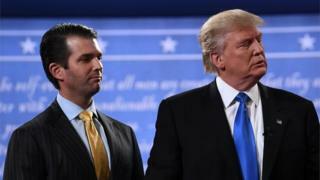 Mr Trump Jr later acknowledged he had agreed to meet after being told Kremlin-linked information about Mrs Clinton would be offered during the talks. He also released the email exchange that brought about the meeting, insisting nothing came of the encounter. The Washington Post says some of the president's advisers fear the extent of the Mr Trump's intervention could place him and some of his inner circle in legal jeopardy. W hite House communications director Anthony Scaramucci was fired on Monday after fewer than 10 days in the post. But then Mr Trump is operating as president the way he did as a candidate - with a small, sometimes chaotic inner circle, where lines of authority are blurred, "expert" advice is often dismissed and all paths lead to Trump. The president offered his input "as any father would", a White House spokeswoman says.